I am always tickled when my friend, Hani, of Haniela's, invites me to do a collaboration with her. :) This time it's a bunny collaboration, and as you can see we were on the same wavelength when we each made a cake, as opposed to cookies. It was meant to be! This cake offered me the opportunity to do something a little different with my new bunny cookie cutters. The ear cutter was made (and given to me) by Bobbi of Bobbi's Cookies & Cutters, designed from my "bunny cookies and milk" cookies. 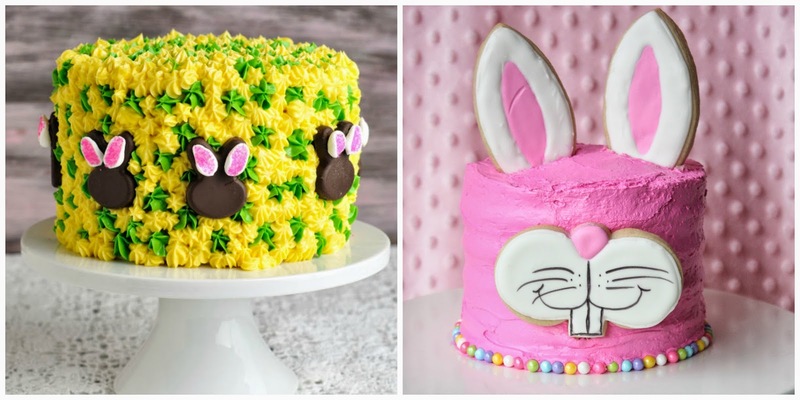 They are actually made to go on the rim of a glass, but I thought they'd be perfect for this Funny Bunny cake. The bunny muzzle cookie was made by Tracy of Whisked Away Cutters, designed from my funny bunny cookie design. Bobbi also made a "funny bunny" cutter. It was so fun working with these two talented gals! Whisked Away Cutters offers different sizes for the cutter; I used the 4-inch size for the cake. 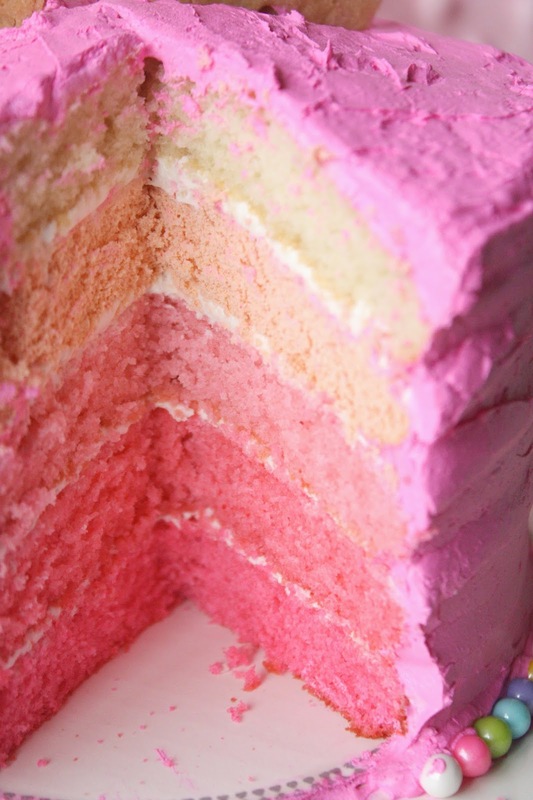 I knew I wanted to make an ombre cake, since I never have. I even made it from scratch, which isn't always the case, using this recipe from Wilton, though I did use pre-made buttercream. I was pretty happy with the pink ombre reveal. The bottom border was decorated with SweetWorks Celebration Pearls. 1. Make the cake according to recipe linked above. 2. Continue with cakes until you end up with the lightest color on top. 3. Frost the entire cake with the icing. 5. On the top of the cake, use a small, sharp knife to make slits big enough to insert the ear cookies. 6. 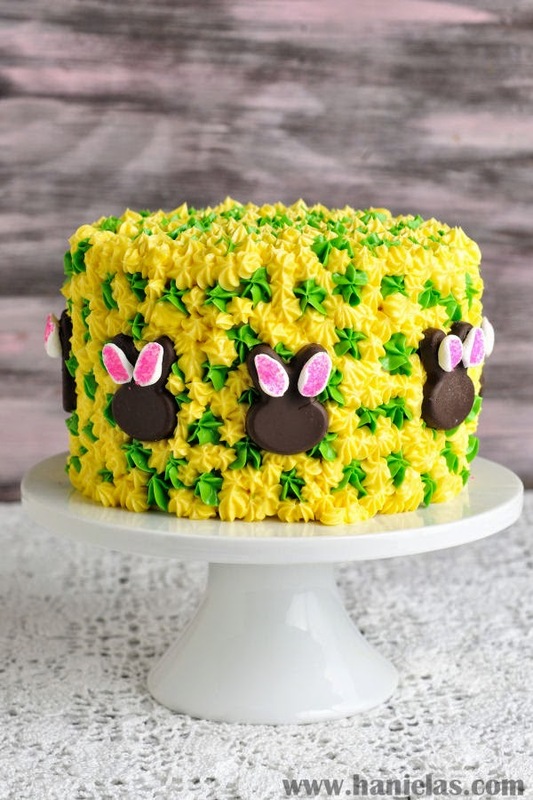 Gently press the candies into the bottom edge of the cake, making a pretty pattern. 1. Bake sugar cookies using this recipe. 2. Cut out parts of the bunny with cutters. 3. Bake cookies and let cool. 4. Make royal icing and tint some of it pink, leaving the rest white. 5. With a #3 tip and the pink icing, outline and fill the inside of the ears. 6. Outline and fill the nose with the pink icing also. 7. Let the pink icing dry for about 30 minutes, and then outline and fill the rest of the ears and the faces. 8. Allow the cookies to dry for 6-8 hours, or overnight. 9. Use edible marker to make details on the bunny face. wow..I am again speechless at your creativity! The cake looks spectacular, Sue. Both cakes are so much fun. I love how you now have cookie cutters that were designed based on your cookies and milk bunnies. That's one of my favorite designs and the cookies look adorable on the ombre cake. Your cakes are adorable and gorgeous. I am not good at decorating cakes at all. You're very talented and creative. Love these designs. What absolutely beautiful cakes Sue! And what a meeting of such creative minds too! :D Happy Easter! !